With a carbon fiber monocoque chassis at its core and a naturally aspirated 5.2-liter mid-mounted V10, the Lamborghini Huracan LP610-4 coupe is the big-hitting Italian with a taste for style. The mid-mounted V10 provides the LP610-4 with 601hp, sent to all four wheels via a 7-speed dual-clutch automatic as the only option. The LP610-4 Avio is a limited edition (250 units) model with aircraft-inspired cabin and exterior treatments. Safety equipment includes multi-stage stability control, carbon ceramic brakes, and an available rear-view camera. With the demise of the Dodge Viper, there are only two production V10 engines in the world – well one actually, housed in the twin siblings that are the Audi R8, and the subject of this review, the Lamborghini Huracan. This may be the ‘little’ Lamborghini, but take that title with a pinch of salt – this mid-engined supercar is still a force to be reckoned with. 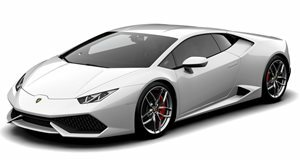 Whereas rivals from Ferrari and McLaren are dedicated rear-wheel drive, the standard Huracan – the LP610-4 coupe – offers all-wheel drive as the standard drivetrain. It could well be that AWD makes the Huracan the ultimate daily supercar. Thanks to Audi, Lamborghini interiors are now truly special spaces to be sat in. The Huracan is no exception, being the first model in the VW umbrella to make use of the 12.3-inch virtual cockpit digital display. As such, infotainment moves out of the center stack – leaving a clean dash design, housing signature hexagonal design elements. Forward visibility is exceptional due to Lamborghini’s angular design and the mid-mounted engine, but that compromises rearward visibility. 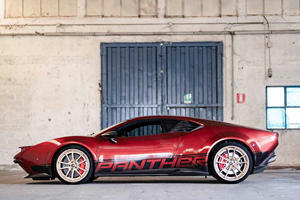 As with most supercars, ingress and egress takes some contortion, but since when has that stopped buyers before? Once inside, a fairly cramped cabin awaits, and while electric seats are a nice option, taller buyers need to avoid them as their mechanicals lift the seats to the point where headroom becomes a problem. But the seats are supportive, for both daily driving and track use, and the abundance of leather cladding throughout the cabin is a of impeccable quality. Though low slung, the Huracan’s available raising suspension helps it get over speed bumps and the like. But in its regular stance, it’s the available magnetorheological dampers that soften the ride on the 19-inch alloys and Pirelli P Zero rubber. It doesn’t have the same sort of ride comfort as a McLaren 720S, but it’s not half bad considering this is a supercar. The adaptive suspension also has the flip effect of making the Huracan handle like a supercar should. In tandem with all-wheel drive, grip is endless, though the front wheels at times become overburdened resulting in understeer. Electromechanical power steering is standard, offering limited feedback, but direct enough responses. The optional variable ratio setup is best avoided though, as its adjustment based on speed rather than steering angle and lock makes the responses somewhat inconsistent. Central to the Huracan’s character, the 5.2-liter naturally aspirated V10’s howling soundtrack is a gale-force breath of fresh air. The LP610-4 denomination indicates the longitudinal, mid-rear mounted position of the engine, whilst the 610-4 indicates 610 metric horsepower and 4 driven wheels. In American money, outputs are 601 horsepower and 413 lb-ft of torque, driving all wheels through a 7-speed dual-clutch automatic transmission. Performance is rapid, with the LP610-4 racking up 0-62mph in 3.2 seconds, and 0-120mph in 9.9 seconds. For the eco-conscious, the V10 can shut off half of its cylinders under low-load situations. In addition to the optional, but best avoided variable ratio steering, and worthwhile adaptive suspension, the Huracan also offers several other available options, including a glass engine cover, reverse camera, and parking sensors. Standard on the LP610-4 are carbon ceramic brakes. Other creature comforts include cruise control, heated and power operated seats, and navigation. A range of interior and exterior cosmetic upgrades are also available, including carbon fiber and two-tone finishes. 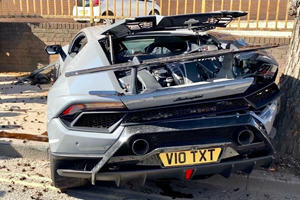 As with most, if not all supercars, local authorities have not crash tested the Huracan, but ABS brakes, and multi-stage stability control keep things in check. The entry-level Lamborghini is anything but an entry-level supercar. It’s a sonorous ode to the naturally aspirated engine in the twilight of its life. Though the all-wheel drive LP610-4 may be prone to understeer, it provides surefooted all-weather control and challenges the likes of the Porsche 911 as the year round supercar for all occasions. That's what these meets are for, right?